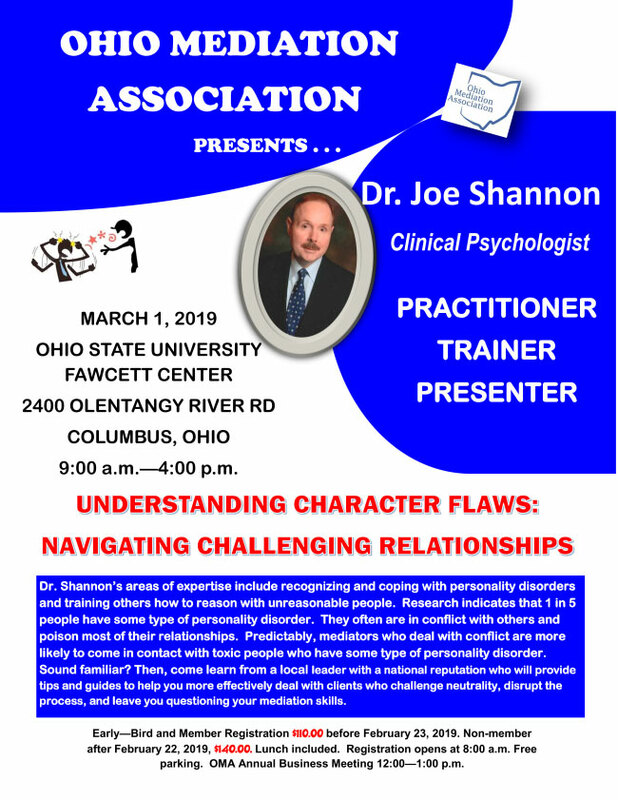 Our Annual Conference on March 1st, 2019, at the OSU Fawcett Center has been approved for 5.5 hours of continuing education credits for counselors, social workers, and marriage & family therapists and also 5.5 hours of continuing legal education credits. Our presenter, Dr. Joseph Shannon, will deliver a full-day training on personality disorders. NIMH estimates that 9.1% of the U.S. population has a diagnosable personality disorder. Because this is a complex subject matter that tends to derail mediations, we encourage Ohio mediators to train and re-train on this topic. Registration is $110 before February 23, 2019.